Chiropractic medicine is a branch of the healing arts which is based upon the understanding that good health depends, in part, upon a normally functioning nervous system (especially the spine, and the nerves extending from the spine to all parts of the body). “Chiropractic” comes from the Greek word Chiropraktikos, meaning “effective treatment by hand.” Chiropractic stresses the idea that the cause of many disease processes begins with the body’s inability to adapt to its environment. The examination of the spine to evaluate structure and function is what makes chiropractic different from other health care procedures. 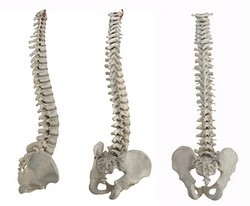 Your spinal column is a series 25 of movable bones called vertebrae. These begin at the base of your skull and end in the center of your hips. Thirty-one pairs of spinal nerves extend down the spine from the brain and exit through a series of openings between each of the vertebrae. The nerves leave the spine and form a complicated network which influences every living tissue in your body. Accidents, falls, stress, tension, overexertion, and countless other factors can result in a displacements or derangements of the spinal column, causing irritation to spinal nerve roots. These irritations are often pain free and are frequently what cause malfunctions in the human body. Pain is a very poor predictor of health; once a condition has reached the point of pain, often a great deal of strain and irritation has already occurred. Chiropractic teaches that reducing or eliminating this irritation to spinal nerves can cause your body to operate more efficiently and more comfortably.